ePublishing Knowledge BaseePublishing Knowledge BaseePublishing Knowledge Base Presenting Related Articles, Posts How do I select related articles, blog posts, listings, events, products and more to appear next to my content? To encourage ongoing engagement on your website and provide more resources to your readers, include related content. This article shows you how to associate related articles and more. 1. Go to the Related section of your article, blog post or other content. 2. 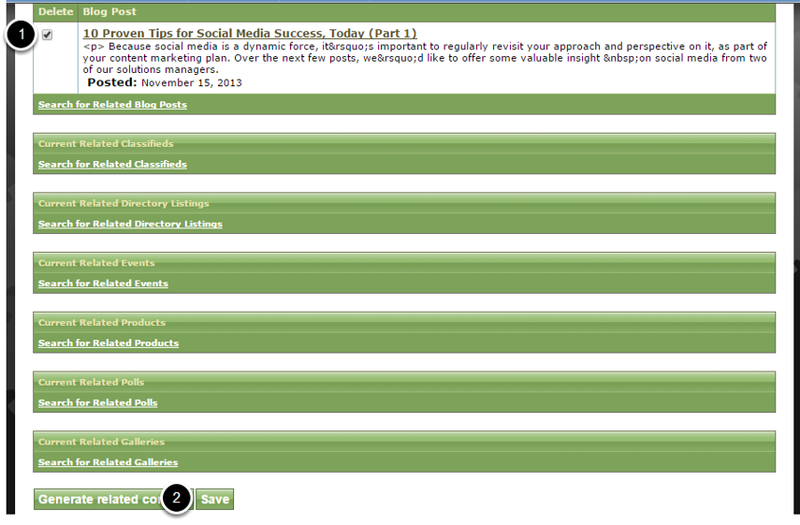 In the Related section, you will see the option to associate articles, blog posts, classifieds and more. Zoom: In the Related section, you will see the option to associate articles, blog posts, classifieds and more. Every website is different in how this content is displayed. 3. 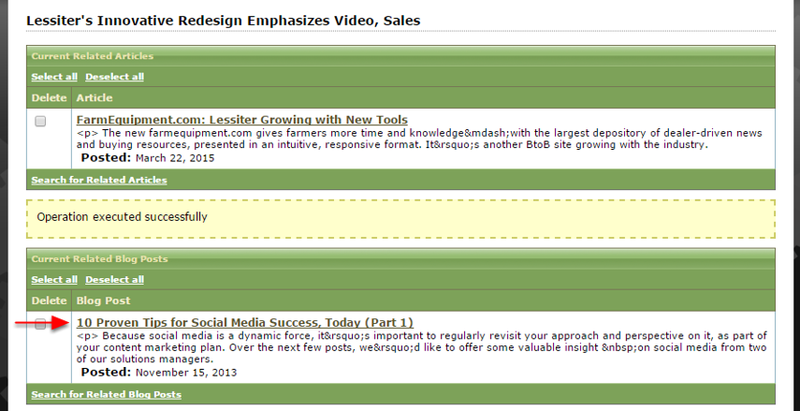 To generate related content automatically, click Generate related content at the bottom of the screen. Zoom: To generate related content automatically, click Generate related content at the bottom of the screen. 4. 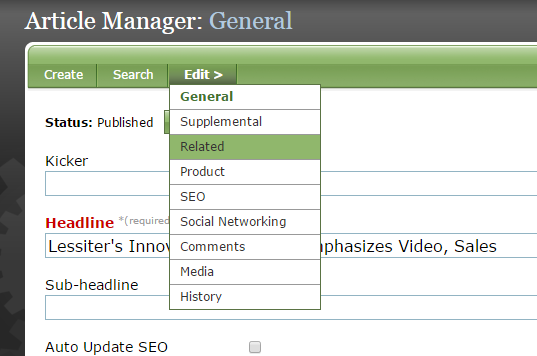 To select related content manually, click on Search for ... under each category. Zoom: To select related content manually, click on Search for ... under each category. 4.1. After you click on Search for ... the relevant Manager will open. Each has a slightly different interface. Zoom: After you click on Search for ... the relevant Manager will open. Each has a slightly different interface. 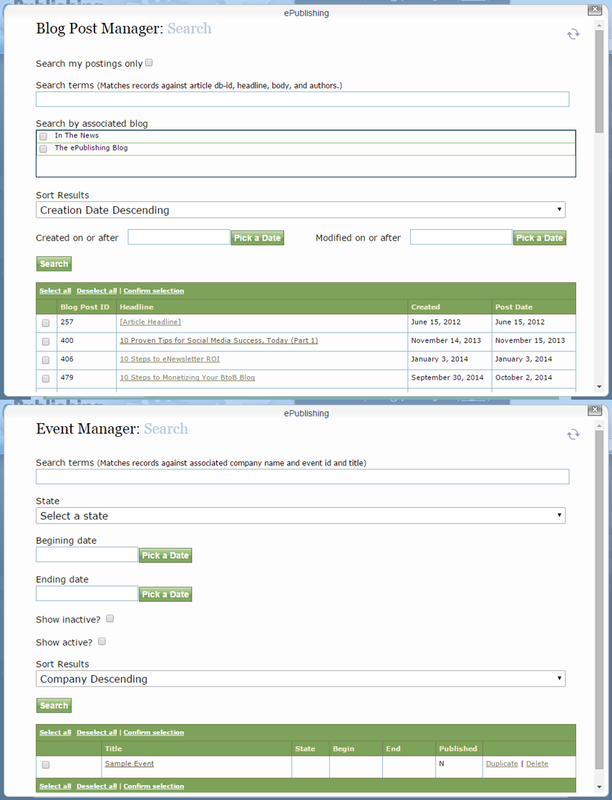 Shown above is the Blog Post Manager search tool and the Event Manager search tool. 4.2. To select an item, click in the box next to the headline (1) and confirm selection (2). Zoom: To select an item, click in the box next to the headline (1) and confirm selection (2). You may select more than one item at a time. 5. After confirming your selection, the headline will appear in its respective category. Zoom: After confirming your selection, the headline will appear in its respective category. 6. To remove an item from Related Content, select the box next to the item (1) and click Save (2). Zoom: To remove an item from Related Content, select the box next to the item (1) and click Save (2). Prev: How do I add or create a new podcast on my website? 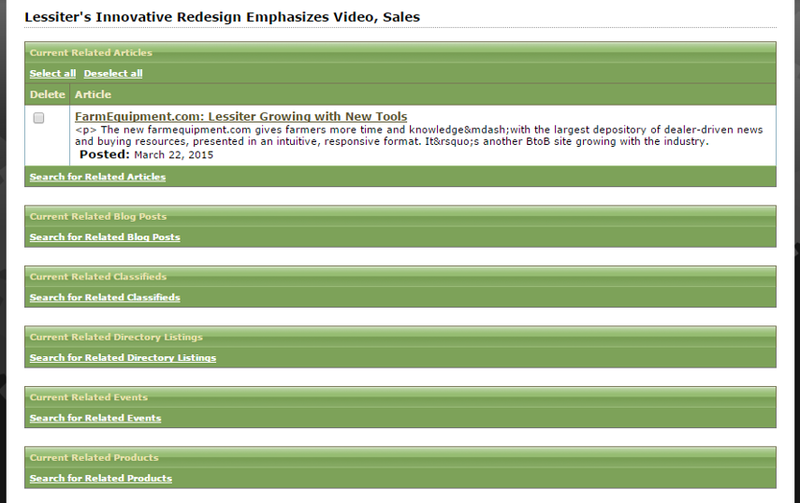 Next: How do I add topics/categories to my website's taxonomy?